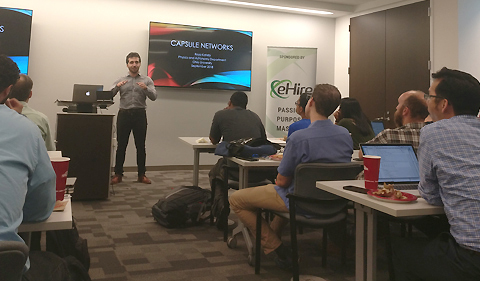 An Ohio University computer science class project sparked interest among the Artificial Intelligence community and led to an invitation to present the results at a recent AI meetup in Atlanta. 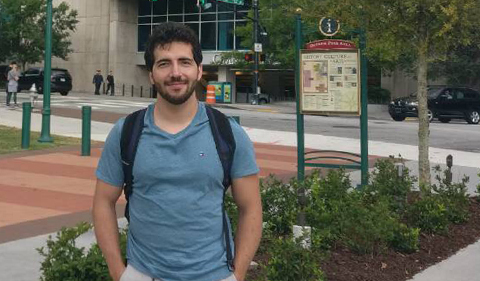 Reza Katebi, an astrophysics doctoral student in Physics & Astronomy was enrolled in the Deep Learning class taught by OHIO computer scientist Dr. Razvan Bunescu when an innovative idea came to him for his class project. Katebi would suggest to Chemistry graduate student and fellow classmate Yadi Zhou that they try using a new deep learning algorithm called Capsule Networks to classify galaxy images. Katebi and Zhou used Capsule Networks and compared their results with those using the traditional model, called Convolutional Neural Network (CNN). They found that capsule networks provide more accurate classification than CNNs and reconstruct the galaxy images as well, and explored current advantages and disadvantages of each. Deep learning is a subfield of machine learning where most of the current breakthroughs and interesting things happen, explained Katebi. One example is the Alpha Zero by Google that beats not only humans but also Alpha Go which is an older version of itself in games such as Chess and Go. Machine learning models, such as the Capsule Networks used in Katebi’s study, can automate tasks in a wide range of domains, tasks that otherwise would be too time consuming or cognitively demanding for humans. However, deploying such models is not easy and requires a good understanding of the underlying theory as well as good programming skills, Bunescu said. Katebi’s and Zhou’s results were such an improvement compared to the traditional CNN, that when others learned about them, they invited him to present a talk, ‘Galaxy morphology prediction using capsule networks’, at the Atlanta Deep Learning Meetup at the Advanced Technology Development Center in Atlanta, Georgia. Katebi used CN to classify galaxy images based on their visual aspects such as size, color, light distribution and other attributes. In astronomy, this classification is called Galaxy Morphology. His results showed him that deep learning algorithms can be used in astronomy to reconstruct poor and low-resolution images with more confidence by preserving the properties of the original object in the image. Not only did the CN classify the images with high accuracies but CN learned the features needed to reconstruct the galaxy images by themselves and only through learned features. They extract abstract features during training on a labeled dataset and then use them to classify new and unseen objects. Katebi says his class assignment and results provide more understanding where deep learning algorithms can be used in astronomy to reconstruct poor and low-resolution images with more confidence since they preserve the properties of the original object in the image. An added bonus, he points out, is that the project became a multi-disciplinary collaboration between astronomers, a chemistry graduate student specializing in bioinformatics, and a computer scientist, where each learned about the other’s research, which brought an added dimension to problem-solving.